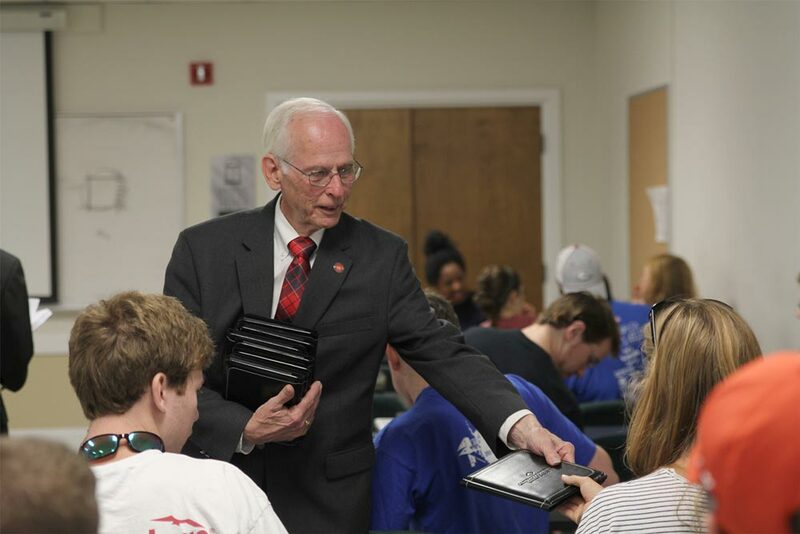 Tom Cochran, a FACS 100 Centennial Honoree, has spent his life in service to UGA. In 2016, he and his wife established the Tom Cochran Emerging Leader Award Fund to provide funding for students to attend professional conferences or training opportunities related to the financial planning profession. Athens, Ga. – The son of a Methodist minister, Tom Cochran moved around a lot as a kid. “I learned quickly that the cast of characters were all the same – only the names were different,” he said, laughing. It turns out the itinerant lifestyle was not for him, and for that he can largely thank the University of Georgia. 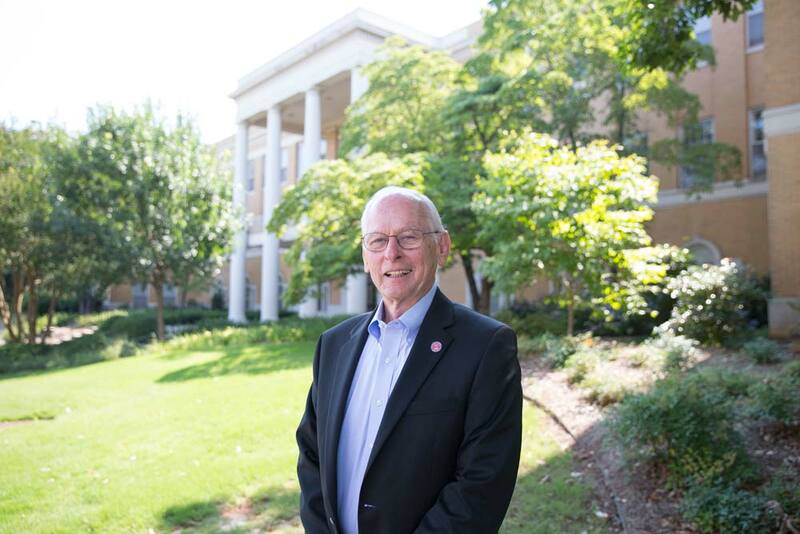 Cochran, who worked his way through UGA as a student pastor in the late 1960s and later spent a short time in the banking industry, took a job as manager of the UGA student activities business office in 1974. He spent his entire career here in student affairs, moving up through the ranks before eventually retiring in 2002 as assistant vice president for finance and administration within the vice president for student affairs office. “One of the great things about having had a career here is it deepened my love for this institution,” he said. Chief among the many perks of his long career, Cochran said, is the relationships he formed with student leaders. A highlight of his career was his role in establishing the Arch Society in 1992, a group of student leaders recognized by their iconic black blazers who serve as official hosts and goodwill ambassadors of the University of Georgia. The idea actually sprang from the now-famous “game between the hoses,” when exuberant Georgia fans stormed the field at Auburn following the Bulldogs’ upset victory in 1986 and eventually got sprayed with water cannons. In an effort to generate goodwill among the respective schools in the years following the incident, the institutions established “better relations” visits. Cochran led a group of student leaders to the Auburn campus and was impressed by the Plainsmen and War Eagle Girls who hosted the Georgia delegation. 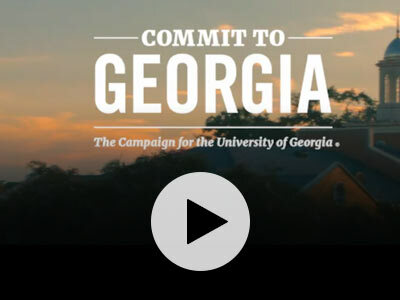 Following retirement, Cochran took a temporary role overseeing what became Georgia United Credit Union, which was looking to better integrate itself into the fabric of the university. After consulting with then-FACS department head Anne Sweaney, Cochran met with FACS faculty members Lance Palmer and Joan Koonce to discuss ideas. That initial meeting eventually led to the creation of a service-learning course in which FACS students provided free tax preparation for low-to-moderate income individuals and families as part of the Internal Revenue Service’s Volunteer Income Tax Assistance (VITA) program. The program served more than 1,100 people last year and has provided “real-life” experience for hundreds of students from both FACS and the Terry College of Business since its inception in 2005. In 2016, Cochran and his wife, Frances, established the Tom Cochran Emerging Leader Award Fund, designed to provide funding for students to attend professional conferences or training opportunities related to the financial planning profession. While Cochran’s degree is not from FACS, he said he is deeply proud of the relationship he’s formed with the college. For Cochran, it serves as another example of the power of a shared vision and spirit of collaboration that drew him back to campus more than 40 years ago. Recognizes students with outstanding leadership and professional promise by providing opportunities to enhance their skills through conferences or training related to the financial planning field. Established by Tom and Frances Cochran, who were lead donors to The Arch Society Endowment Fund and also established the Frances Cochran 4-H Award Endowment Fund with the 4-H Foundation.